Back in October we released a broadcast FM bandstop filter for removing strong signals in the 88 – 108 MHz region. Today we’re releasing a new broadcast AM high pass filter (BCAM HPF) with a 2.6 MHz cutoff. The cost is the same as the BCFM bandstop filter at $14.95 USD including free international air shipping. Faster shipping options may also be chosen if desired. We’ll eventually have this product on Amazon USA in a few months too, but for now it is only available from our Chinese warehouse. The filter comes in a 2.8 cm x 2.8 cm x 1.3 cm aluminum enclosure and uses female SMA connectors on each end. Included in the package is also a SMA male to SMA male straight barrel adapter. 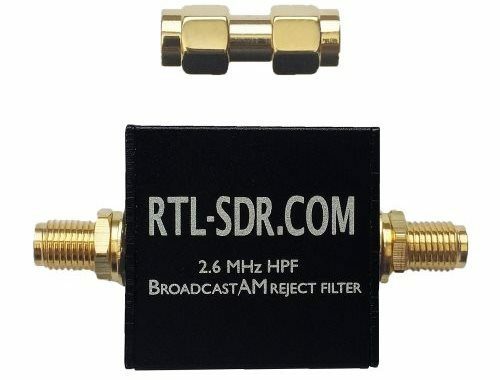 This filter is designed to eliminate broadcast band AM (BCAM) stations by attenuating (blocking) any signals below 1.7 MHz. In reality due to roll-off the filter is usable from about 2.5 – 2.6 MHz and above. We’ve also uploaded a video below that shows a demonstration of reception when using an RTL-SDR.com V3 dongle in direct sampling mode together with the BCAM HPF. In the video we first compare reception against an upconverter (the Spyverter). It’s worth nothing that the upconverter can receive signals well even without the filter in place. Using the filter does still help the upconverter receive a little bit better but the effect is not shown in the video. Then we simply scroll through the spectrum and listen to a few signals.